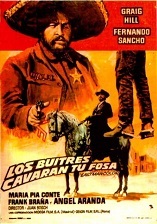 Hired by Wells Fargo to catch the outlaws who have been robbing their stagecoaches, a bounty hunter (Craig Hill) springs a prisoner (Angel Aranda) to help him track the thieves down. But will the mismatched pair kill each other first? Also stars Fernando Sancho and Dominique Boschero. Also with Maria Pia Conte.